This is not the big brambly invasive bully lining area rivers and roadways. 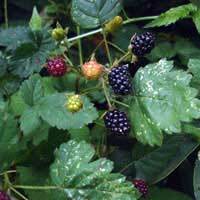 Although our native blackberry likes to spread, it does not form self supported brambles. Instead it rambles about the landscape as a vine-like ground cover.